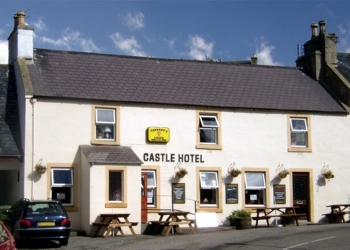 The Castle Hotel is situated in the traditional fishing village of Portmahomack in Easter Ross, near Tain and Dornoch in the Highland Region of Scotland. The village enjoys a wonderful setting on a bay with a fishing harbour and excellent swimming beach. There are spectacular views over the Dornoch Firth and Moray Firth to the hills of Ross-shire and Sutherland. Portmahomack has a golf course, pubs, restaraunts, shop and post office, dolphin watching trips, sea fishing trips, excellent walks and great ambience. The UKs fourth-tallest lighthouse at Tarbat Ness is three miles outside the village. The village has excellent beach access for all forms of water sport including sailing, jetski, windsurf, diving and snorkelling. The Castle Hotel has rooms available for visitors, serves meals and has a friendly pub where you can play darts or enjoy the music or just have a quiet chat. The annual village Gala is full of activities and is complemented by the nearby Gala at Tain which is regularly attended by the Red Arrows display team. Tain is the oldest Royal Burgh in Scotland dating back to its first Royal Charter in 1066. Tain sits three miles across the Dornoch Firth from Royal Dornoch. All three locations are golfing centers and all three golf course clubs welcome visitors. The Castle Hotel Portmahomack is a wonderful place for a holiday or vacation, even a short weekend break.